Do you have a submission that features fabulous French style? Then we want to hear from you. You can find out how to submit further down the page, but if you have any questions about submitting or general questions regarding French Wedding Style please read our FAQs. If you require help submitting or if you can’t find the answer email submissions@frenchweddingstyle.com. Q What type of submissions to you accept? A. You don’t have to be a photographer to submit; planners, couples or wedding suppliers please don’t be shy. But before making a submission please gain permission from the couple and especially the photographer who copyright remains with. Q. Do you feature real weddings that take place in other countries than France? A. As the focus of the blog is for brides planning their weddings in France, this is our preferred geographic location. However, we do make exceptions for truly unique and beautiful weddings with a French flavour. Q. Do you feature content that has been featured elsewhere? A. We accept all submissions that have previously been featured in print. We also accept submissions if they have been featured on other blogs, but do please let us know where and when at the time of submission. Please do not send in submissions that you have submitted to other blogs and are waiting to hear on. Q. How long does it take to hear back regarding a submission? A. We always aim to respond to submissions within 5 days, usually less. However if you haven’t heard from us after this time, please do send a follow up email. Q. In addition to submissions, do you provide advice for suppliers growing their destination wedding business? A. It is our passion to help companies grow their destination wedding business, however due to the quantity of questions we can’t help out companies individually. 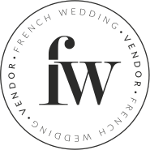 If you are looking for assistance with your marketing or promotional activities, please contact Editor Laura on info@frenchweddingstyle.com who provides limited 1-2-1 services to take your business to the next level. Q. I am a planner looking for venue recommendations for my clients, can you provide a list of venues please? A. Due to the complex nature of finding a wedding venue to suit your particular couple, French Wedding Style doesn’t provide a venue finding service, however you can find a list of wedding venues in France on our Directory and also in-depth wedding venue features here. We are always looking for French wedding experts who can provide the FWS readers with tips and advice to enhance their wedding planning process. Please note that guest blogging opportunities are not a forum for promotional product or service posts as ‘sponsored posts’ are available to purchase. Please add all of the vendors involved, as well as their website and if known their Instagram handle (this is used when the submission is published and promoted via our Instagram network). Whilst every effort will be made to credit photographers and suppliers where supplied, if you see a crediting omission please do email info@frenchweddingstyle.com. Monique, I love your blog! I found it today whilst trawling Pinterest looking for ideas for our FIRST wedding which will be taking place in July in Aveyron, SW France. We (myself and the bride, Laura) are now planning to keep a close photographic record and a diary so we can eventually share the results with you. We will certainly be using FrenchWeddingStyle as an inspiration! Welcome Christine and Oddy to the home of French style wedding trulovers!